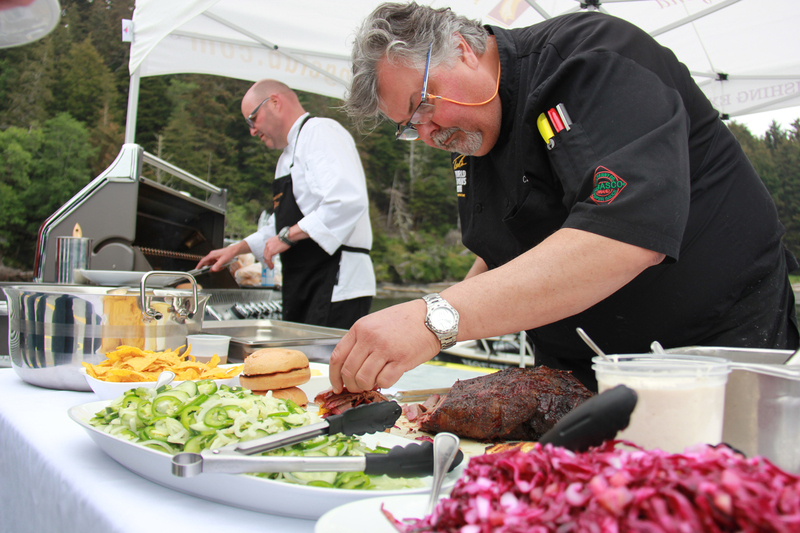 We welcomed our guests to the first annual Ultimate Grill Showdown, in honor of Walter Pelliccia, with light winds and overcast skies. 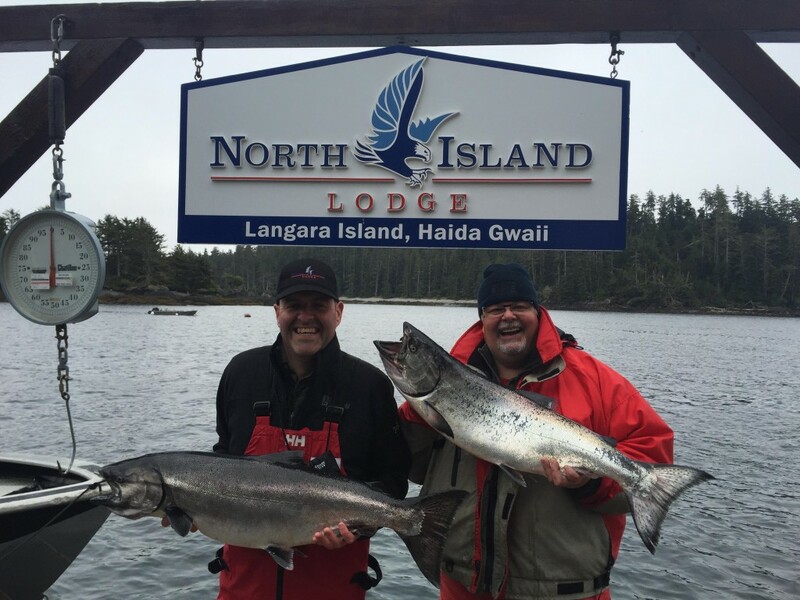 After North Island Lodge General Manager Todd McIntyre welcomed the guests with news of good fishing and a brief outline of the trip, it was time to head out to the fishing grounds. It didn’t take long until the guests were on the water and back in time for dinner with a full report. Al Perrott came in with a 24 pound Chinook to top the leader board, while one of the featured Chefs, Christian Pritchard, came in with a 22 pounder and Park Heffelfinger’s wife Charmaine rounded up the next largest fish with a 20 pound Chinook. Park also caught a 24 pound Halibut just off Coho Point. * Excited guests prepare to touch down. 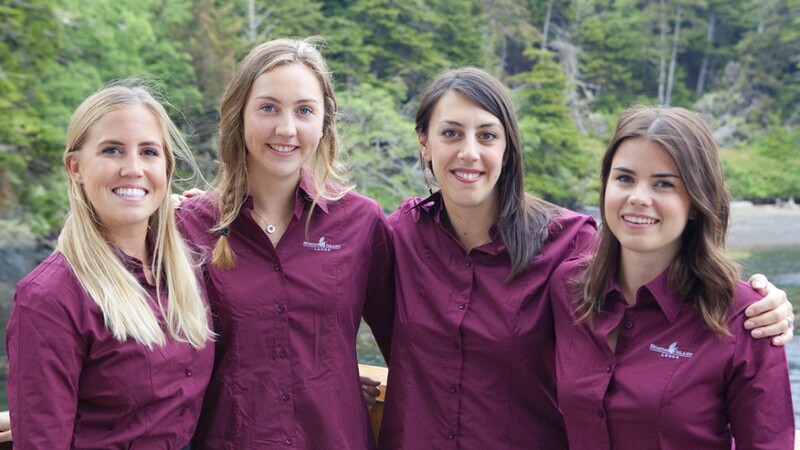 * A few of the North Island Lodge staff eager to get the season underway. * Chef Christian Pritchard and Chef Ted Reader pleased with the fruits of their labor. Guests were quick to pop out of bed this morning knowing what we had in store for them today: the world’s best Salmon fishing and some of the countries best BBQ prepared by Chefs Ted Reader and Christian Pritchard. 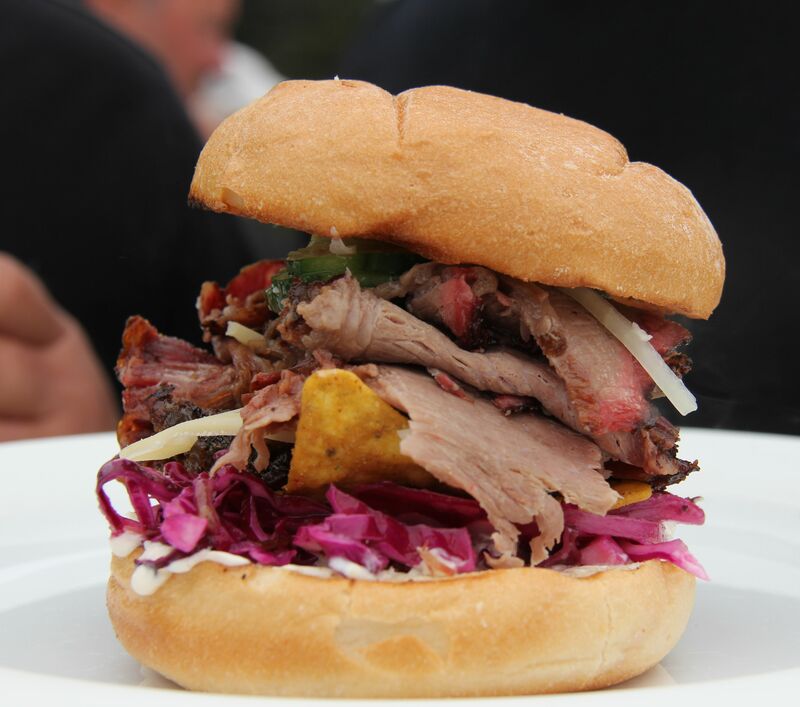 Lunch was incredible – smoked brisket with red cabbage and rhubarb slaw, pickled cucumber jalapeño onion and horseradish topped with Dorito Ranch chips and Swiss cheese made hot and fresh for the guests returning from a great morning on the water. What could be better? Dinner! Day 2’s dinner started with Prawn doughnuts with a sirachi honey and a smashed cucumber snap pea salad. 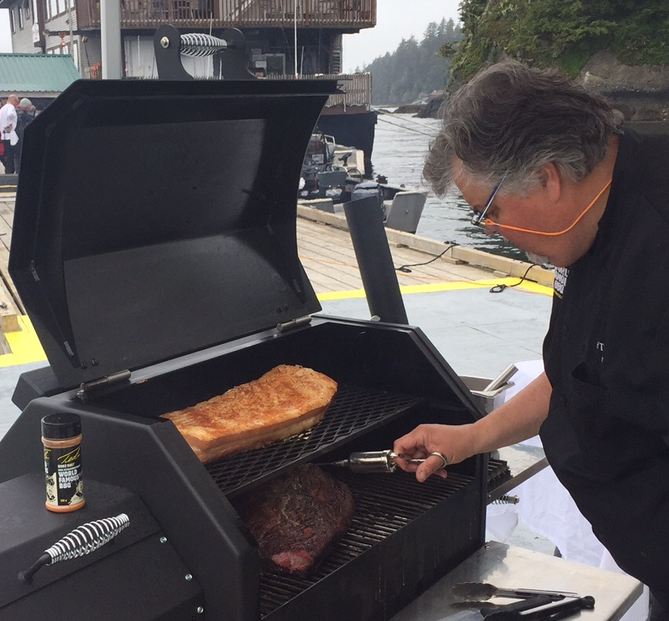 The main, reversed seared smoked rib eye with planked smashed potatoes served on custom made West Coast Fishing Club cedar planks. But wait, Ted and Christian were not done – dessert was a banana and white chocolate and Skor bar bread pudding topped with drunken raspberries. As the evenings feast settled in there was no doubt in everyone’s minds that they would sleep well tonight. Back to the fishing! Don Wells has taken top spot on the fish board with a beautiful 25 pound Chinook caught this afternoon after lunch. Stay tuned for tomorrow’s update, as Ted and Christian will be out on the water while Park Heffelfinger prepares his creations for the day. 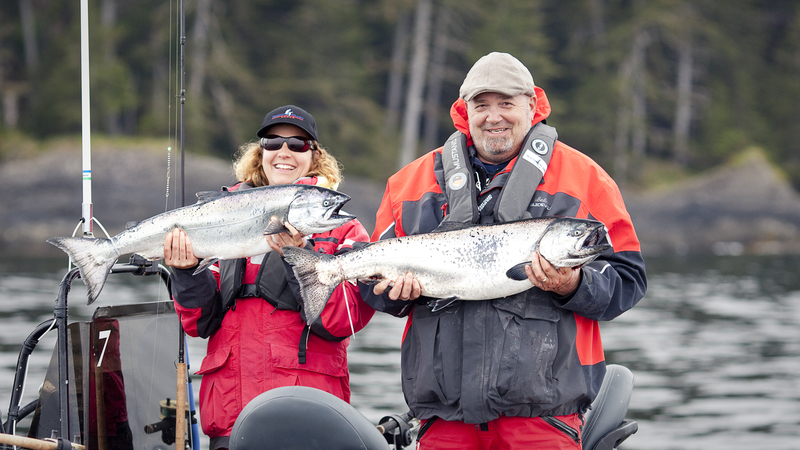 * Park Heffelfinger and wife Charmaine with a few nice Chinook. 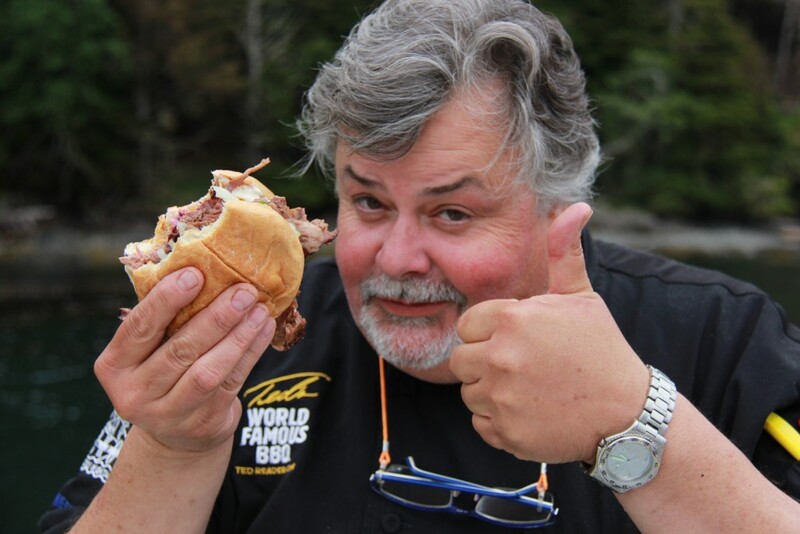 * Chef Ted Reader injecting some additional flavor into the brisket. * Christian and Ted putting the final touches on lunch. * The finished product, smoked brisket with red cabbage and rhubarb slaw, pickled cucumber jalapeño onion and horseradish topped with Dorito Ranch chips and Swiss cheese. * Chef Ted Reader approves. * Prawn doughnuts with a sirachi honey and a smashed cucumber snap pea salad. 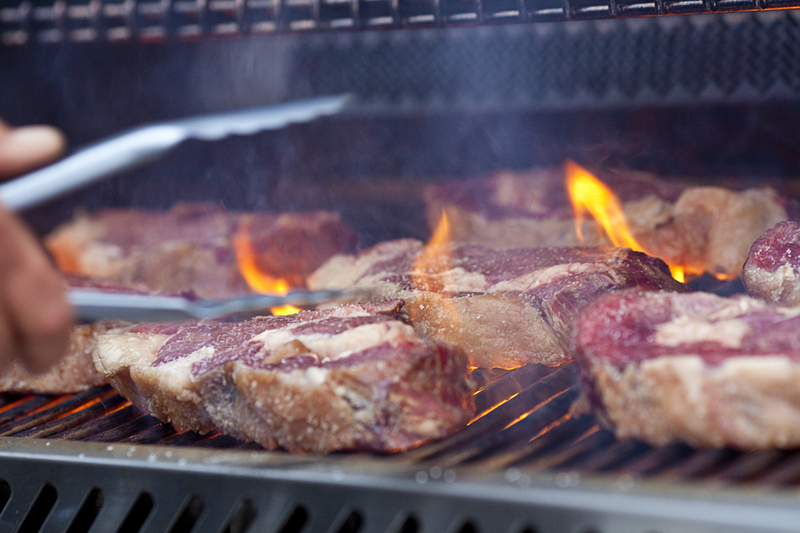 * Rib eyes on the grill. Park Heffelfinger is in the kitchen today with Chef Liam and his crew preparing today’s culinary adventure. For lunch, Park has prepared a sausage and corn chowder topped with Dungeness crab and chive oil. Off the grill we have one of Memphis Blues classic menu items pulled pork sliders three ways – classic Memphis, Carolina mustard sauce and tangy western Carolina sauce. Memphis style bbq pit beans and apple slaw. For dinner, Keeping with past Executive Chef, Walter Pelliccia’s traditional platter service, Park is preparing a seafood melody consisting of deep fried corn meal breaded oysters with remoulade sauce, New Orleans style bbq’d shrimp with a dry rub brown butter sauce and fresh Dungeness Crab with a Smoky bacon lardon tossed wild green salad piled in the middle. Main course – smoked honey bourbon glazed St. Louis pork side ribs, Memphis dry rub French fries, grilled zucchini and mushrooms with a Middle Eastern garnish. Dessert – strawberry rhubarb cobbler with nut crust vanilla bean ice cream and topped with bourbon caramel sauce. As the sun set on the end of day 3, most of the guests were outside enjoying the breathtaking view of the calm waters inside Beal Cove while the lowering sun shone across the pass. There was lots of laughter, full stomachs and talk about tomorrow’s fishing and of course, food. Prior to the end of his night, General Manager Todd McIntyre thought no barbeque trip would be complete without fresh Salmon smoked on the Yoder Smoker. As the guests went off to bed to rest up for the next day, Todd was in the kitchen preparing some Salmon to hit the smoker in the morning. On the morning of day 4 our guests woke up to overcast skies and a little more wind out of the Southeast. That didn’t stop all the anglers from heading out first thing. 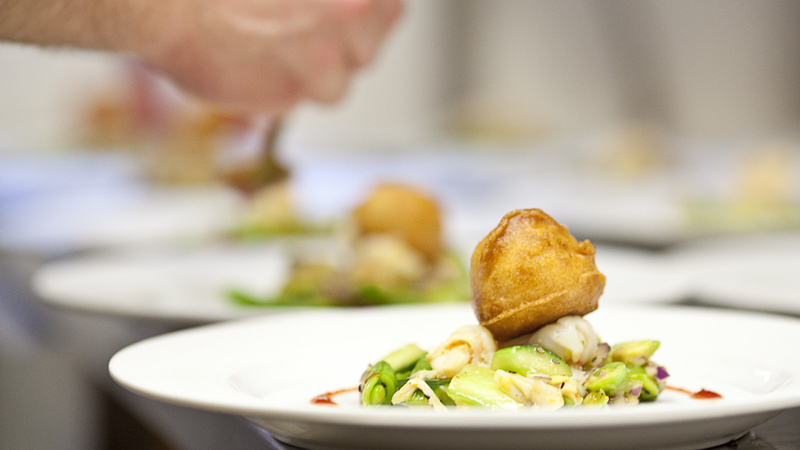 At lunch, guests were returning with their catch and ready to enjoy Chef Liam’s fresh fish and chips. 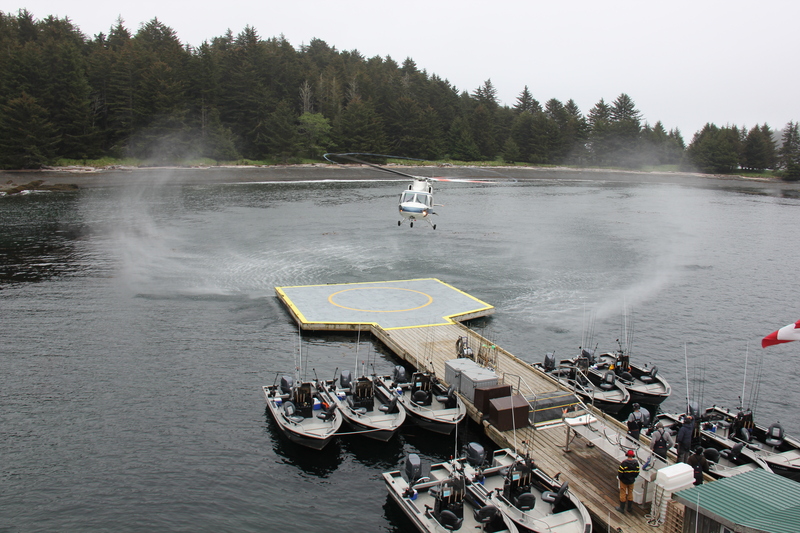 The afternoon was almost a cookie cutter of the others, smiling guests returning with Chinook ranging from 15 to 20 pounds and a few in the high twenties. There were also stories of the ones that got away! Ken Gardiner, who was the first guest to catch a Tyee of The West Coast Fishing Club’s 2015 season, came in with his fishing partner Ian McRae with a junior Tyee at 29.5 pounds. Al Perrott also just missed a Tyee with a 28 pound Chinook. While guests were returning, Park, Ted and Christian were busy preparing for the night’s dinner. What could top the first three nights? Chef Liam started the night with freshly made sushi, which included the now famous “Todd roll” which of course included some of his smoked salmon. Park entertained some guests up on the top deck going over his “how to” Cornish Game Hens on the Napoleon Grill. Christian did “Crostini three ways” and Ted amazed us all with cedar planked Salmon and Pork Belly also done on the Napoleon. After dinner most guests were too tired (and full) from all of the excitement on the water over the last few days. Those who managed to make it until just before midnight were treated to Chef Liam pulling out his guitar for an impromptu jam session. Believe it or not, those guests still made it out on the water prior to change over the next morning. Changeover morning greeted us with partly sunny skies and some productive fishing. As guests arrive into the South Terminal, our staff will be there to greet them with one final gift to keep them thinking about grilling and smoking until next year. By now everyone that joined us on the first annual Ultimate Grill Showdown is almost home and probably still full. The Napoleon Grill and the Yoder Smoker have been put away, ready for 2016!